On the Big Island of Hawaii's Kona-Kohala Coast, Hualalai recaptures the spirit of another time. Swaying palms hide the rooftops of the beachfront bungalows and authentic Hawaiian homes. 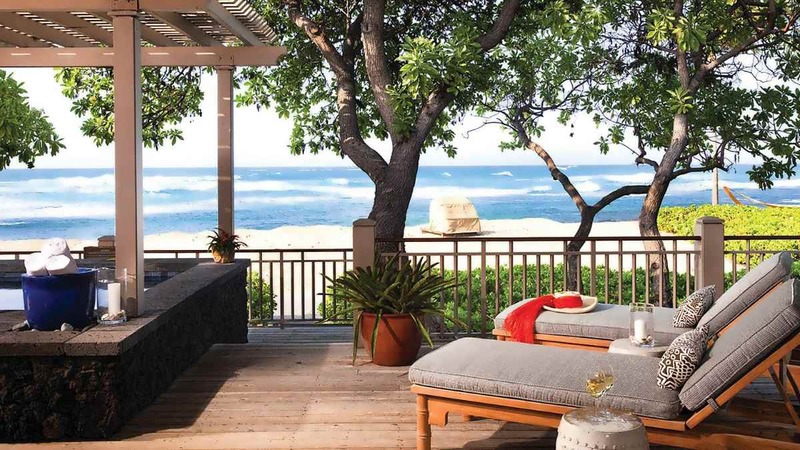 The Four Seasons Resort Hualalai's 243 guestrooms feature furnished lanais, plasma televisions, and granite bathrooms with deep soaking tubs and separate showers. Guests of this Four Seasons Resort can dine at the 2 beachfront restaurants or golf clubhouse restaurant and enjoy drinks and ocean views at the 2 lounges. In addition to the 18-hole, beachfront golf course, the 5-star resort offers 8 outdoor tennis courts and 7 outdoor swimming pools including a children's pool and an adults-only pool that features day beds, hammocks, a swim-up bar, and a spa tub. After working out or taking a fitness class in the sports club, guests can indulge in a massage or spa treatment at the full-service spa. Courses for all ages are offered at the Ka'upulehu Cultural Center including Hawaiian crafts, music, dance, and language. Event facilities measure 39,969 square feet with 5 indoor salons and outdoor space including gardens, lawns, beaches, and the lava-rock Hoku Theatre. Business-friendly amenities include a 24-hour business center and 24-hour concierge. Complimentary self parking and valet parking surcharge. 2-story bungalows at the Four Seasons Resort Hualalai house the 243 guestrooms, which feature furnished lanais with ocean, golf course or garden views. Plasma televisions with cable channels and entertainment centers with DVD/CD players are available in living areas. Wireless high-speed Internet access is complimentary. Deep soaking bathtubs and separate glass-enclosed showers are standard in the granite bathrooms. Rooms also include coffee/tea makers, bottled water, refreshed daily, and clock radios with MP3 docks. Housekeeping is offered twice daily and an aromatherapy turndown service is provided each evening. • Beach Tree - The restaurant features vaulted ceilings and expansive ocean views, providing the ambiance of a Hawaiian beach house. California cuisine with an infusion of Italian is served for lunch and dinner. Al fresco dining is available and Hawaiian music is played nightly. • Pahu i'a - The oceanfront restaurant has an aquarium at its center and terrace for al fresco dining. Hawaiian cuisine is served and meals include breakfast and dinner. On Saturday evenings, the restaurant offers a beach barbecue buffet. • Hualalai Grille - Located in the golf clubhouse and offering views of the golf course and resort grounds, the restaurant serves Asian-Pacific cuisine from an exhibition kitchen. Open for dinner. Reservations are recommended. • Lava Lounge - Located above the Pahu i'a restaurant, the 33-seat lounge faces the Kona-Kohala Coast. Guests can enjoy light fare from the pupu menu along with cocktails and other beverages. Open each evening. • Beach Tree Bar - The beachfront bar is steps from the ocean and serves light fare along with tropical drinks. 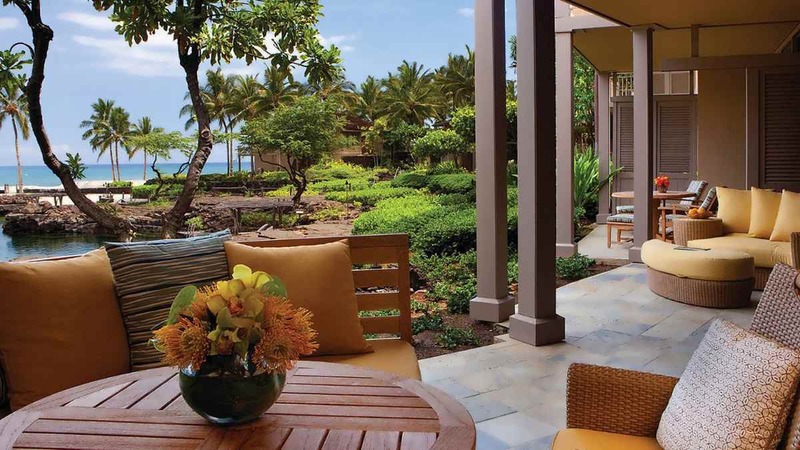 Set in a lush garden setting, the Hualalai Spa offers indoor treatment rooms along with outdoor, secluded hales. Before treatments guests can relax in the open-air garden, spa tubs, saunas, steam rooms, and cold plunges. The spa offers a variety of massages, facials, and body scrubs using local natural ingredients. Wellness services include acupuncture, naturopathy, and nutritional consultation and salon services are offered. The simulation was done for 10 nights (pice per night is shown below) with 8-10 months in advance, for 1 room, 2 persons. • Mauna Kea Summit - At 13,796 feet, this peak offers an incredible view of lava, desert, the valley and Mauna Loa. • Kona Kozy's Comedy & Magic Show - Experience "Big Island Magic" and the "Aloha Spirit" with multiple award-winning magician and funniest man on the islands. • Hulihe'e Palace - Founded in 1838, this site is where the Hawaiian monarchy resided. 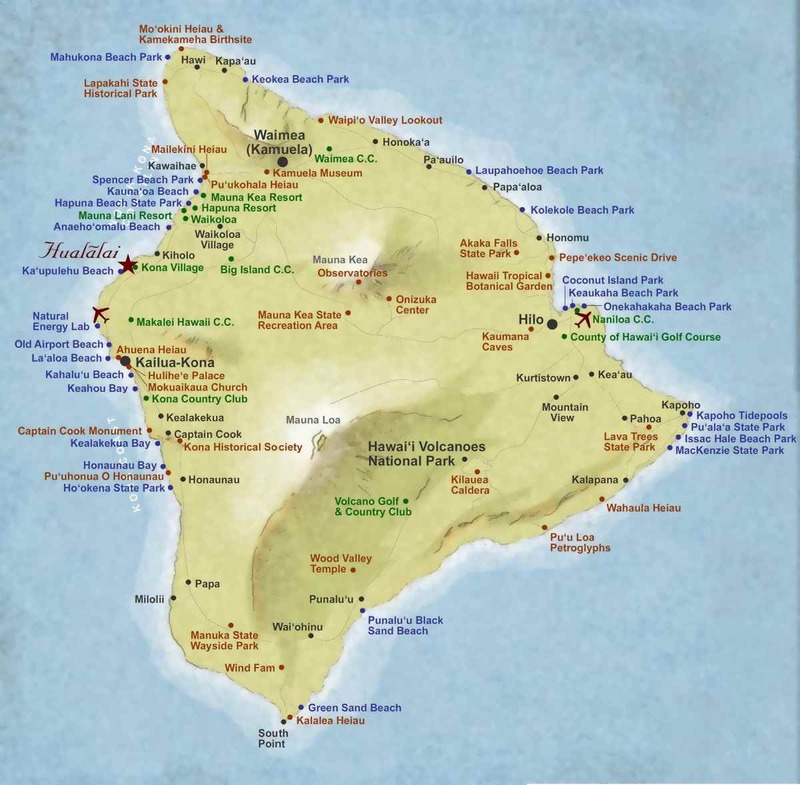 • Kaloko-Honokohau National Park - Almost unknown it has a visitor center and great turtle watching along with hawaiian fish ponds use your golden eagle pass . Has many remote beaches. • Saddle Road - Built in 1942, this 53-mile long road is extremely dangerous with its narrow structure, blind turns, rough surface and single-lane bridges. 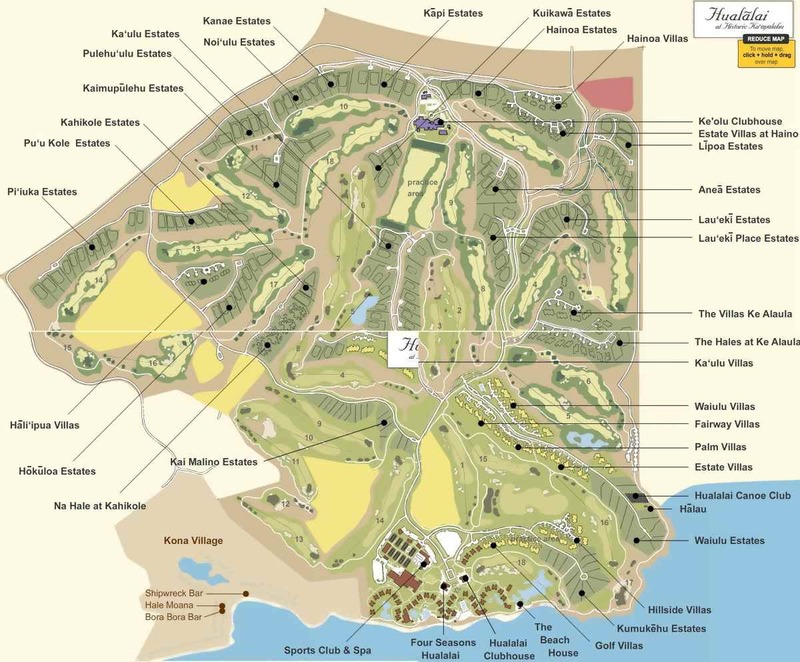 • The 18-hole Jack Nicklaus signature Hualalai Golf Course is built on black-lava rock and winds over 7,100 yards beginning and ending at the ocean. A golf shop is located in the clubhouse and a driving range and golf instruction are available. 8 outdoor Rebound Ace tennis courts include 2 lighted for evening play. Complimentary tennis rackets and balls are provided. A tennis shop and tennis lessons are available. 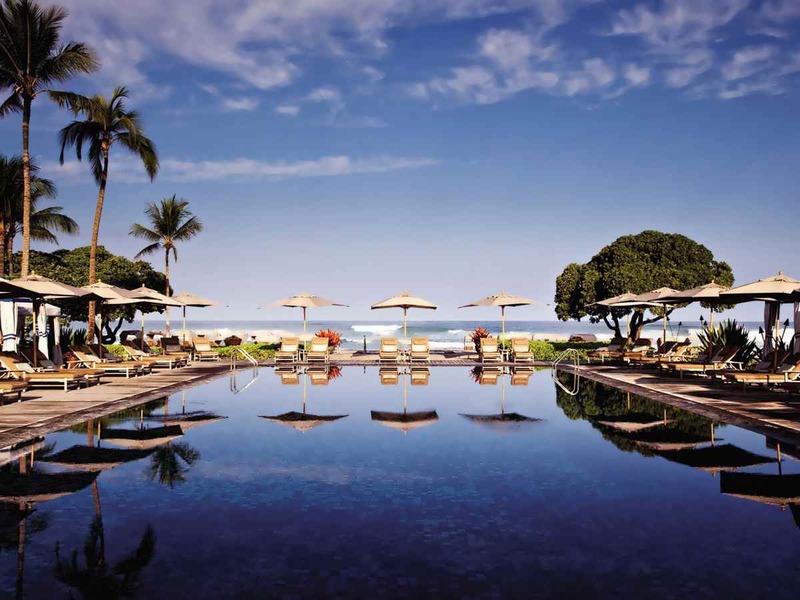 • Four Seasons Resort Hualalai at Historic Ka'upulehu is listed in the 2013 Condé Nast Traveler Gold List of the world's best places to stay. • Ranked Nr.1 on TripAdvisor.com from "Top 25 Luxury Hotels in the World"
The resort of Hualalai is located at 100 Ka'upulehu Drive, just 15 minutes north of the Kailua-Kona International Airport off the makai (towards the ocean) side of the Queen K'ahumanu Highway. 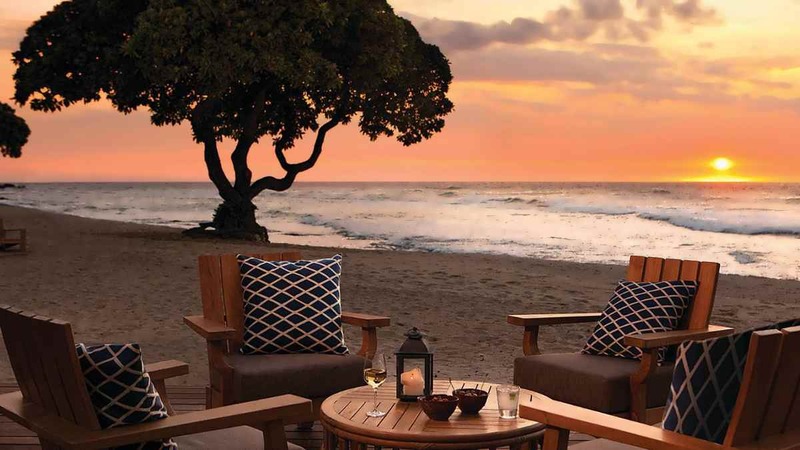 Secluded on a private beach along the Kona-Kohala Coast, the Four Seasons Resort Hualalai is 7 mi (11 km) from the Kona International Airport and 21 mi (34 km) from the Holualoa Village. The Hawaii Volcanoes National Park is 99 mi (159 km) away. Many airlines offer daily nonstop service from Los Angeles and San Francisco to Kona International Airport. Japan Airlines schedules daily nonstop flights between Tokyo and Kona. Many rental car companies have vehicles available at Kona International Airport. “If you are looking for quiet, reserve a room facing the Kings' Pond pool. It is only open from 10 am to 4pm, so mornings and late afternoons are serene"
“Ground floor rooms have wonderful private outdoor showers. Bungalow style adds to the smallness of this big resort. “Ocean front is well worth it!” - "Ocean view though sometimes the party at the pool can be noisy "
"The site of the hotel is beyond lovely—nestled on the shore among the blackened lava flows and banyan trees. I can't speak to the area around the resort, because it's so beautiful that honestly, you don't feel the desire to venture out."